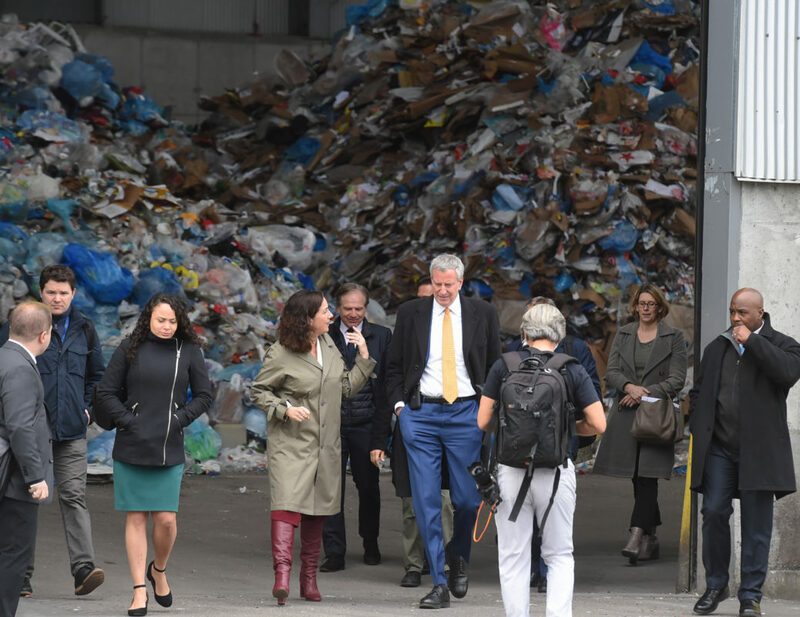 SUNSET PARK – Mayor de Blasio signed an executive order at the Sims Municipal Recycling Center in Sunset Park April 11, that will end the direct New York City purchase of unnecessary single-use plastics in favor of compostable or recyclable alternatives. The city spends about $1 million on plastic food-ware every year, weighing approximately 1.1 million pounds which includes plastic straws, cutlery, plates, bowls, cups, and trays. 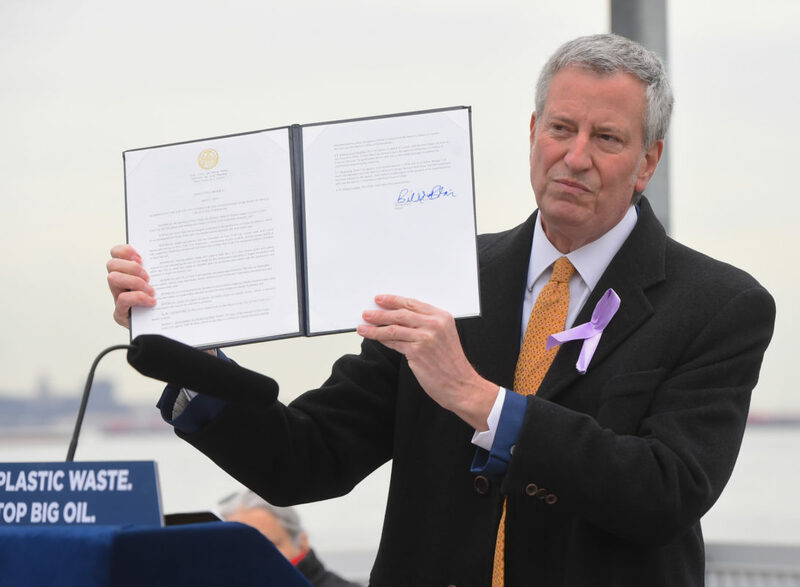 The Executive Order, according to the mayor, will reduce New York City’s carbon emissions by approximately 500 tons per year, decrease plastic pollution, and reduce risks to wildlife. 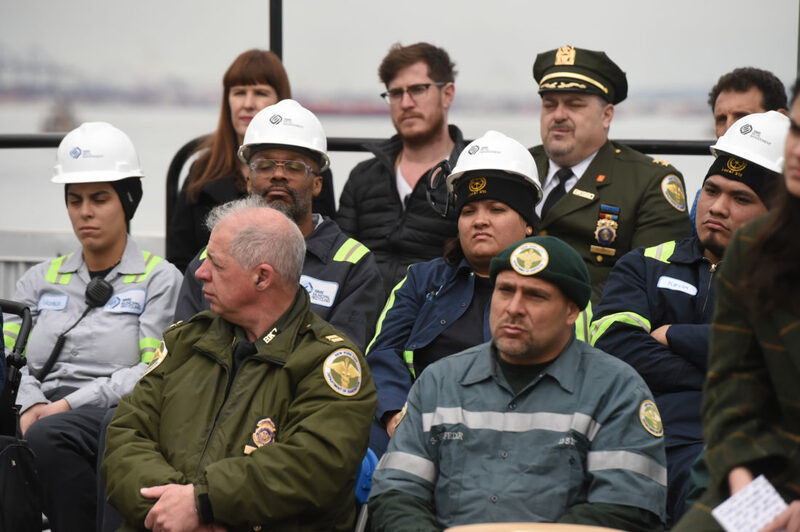 The mayor signed the order with city officials, Sanitation workers and other local leaders in attendance at the massive recycling center off Second Avenue. The plant used to be the site of a car storage area before it was completed six years earlier. The plant separates bottles, cans and other metal and plastics, in addition to large piles of paper to be converted back into usable paper products and takes metals and reclaims them for reuse. City officials estimate this order will reduce the purchase of single-use plastics by city agencies by 95%, and will begin implementation by the end of the year. Some single-use plastic items including plastic straws are deemed necessary for some people— including New Yorkers with disabilities—who cannot use currently available alternative products and affirms the ability of all individuals to receive single-use plastic items without question or cost upon request. Under this executive order, a sufficient supply of single-use plastic food-ware will continue to be made available for anyone who requests such items and maintained for other purposes including emergency preparedness and medical uses. No new contracts will be signed for single-use plastic food-ware, the mayor said, other than to maintain a sufficient supply of certain items to be provided upon request. All city agencies will begin reducing their use of single-use plastic immediately and must also prepare a reduction plan within 120 days. Full implementation of these reduction plans is targeted for the end of the year. 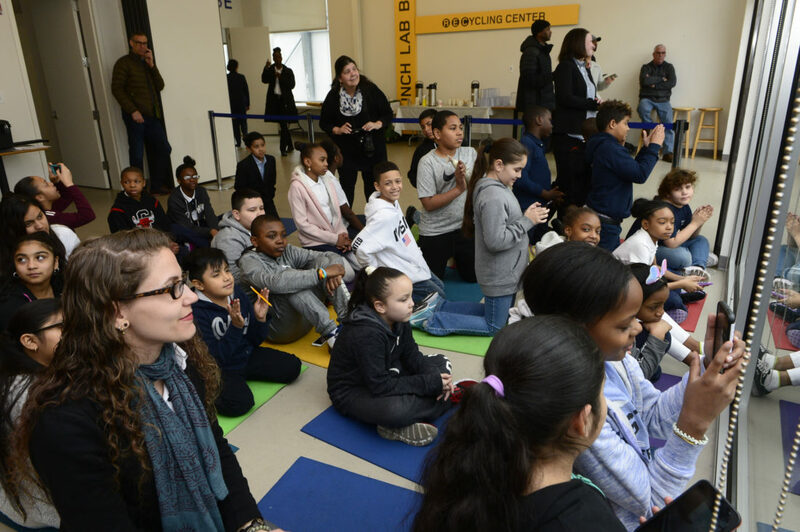 Children form PS75 listen to the mayor talk about recycling and elimination of plastics. 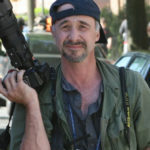 Todd Maisel/Bklyner. The policy is in keeping with other proposals that he has sought. The mayor said he is seeking for the city to divest from petroleum companies that he said “have polluted our environment with only profit in mind.” He said the city will sue petroleum companies for creating pollution and promoting products that add carcinogens to the environment. Mayor de Blasio also said he is in support of City Council legislation to reduce the single-use plastic food-ware in private establishments and will work with the Council to ensure the legislation includes appropriate accommodations for individuals who cannot use non-plastic alternatives in a similar manner to this executive order. About 36 million pounds of single-use plastic food-ware is collected from residential waste stream with tens of millions more pounds collected from commercial establishments. Discarded plastics also get discarded as litter and washed into waterways, impacting water quality and harming plant and animal life in New York City’s ecosystems. Reducing single-use plastic use, while simultaneously maintaining a sufficient supply of certain single-use plastic items since some people cannot use alternative products, will lessen the City’s reliance on petroleum-based products in a way that takes the needs of all New Yorkers into account, the mayor said. 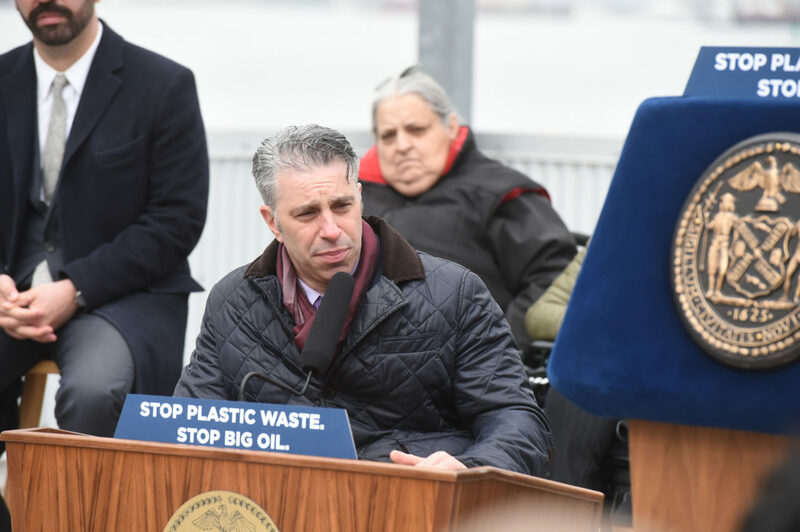 Victor Calise, commissioner for the mayor’s office for People with Disabilities said that while it was good to reduce plastic waste, those who require plastic straws and other plastic devices will be ensured the products they need. “The Mayor’s Executive Order will significantly reduce plastic food-ware purchased using City funds, while simultaneously ensuring that the needs of people with disabilities and others who cannot use alternative products are also at the forefront,” he said. 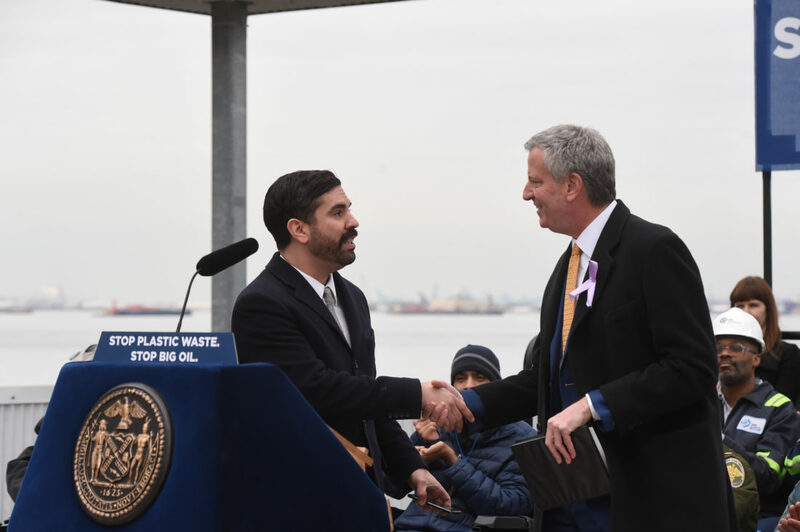 Bushwick Councilman Rafael Espinal greeted the news, saying plastic waste was damaging to the city and planet. She said the mayor’s actions will do a lot to help the environment and government policies. She said some have tried to downplay the impact of young people on the conversation will find that they are losing. Children from Public School 75 was on tour of the recycling facility and the children stayed to listen to the mayor. Annie Yasmin, a fifth grader said she believed the mayor was doing the right thing for the environment. 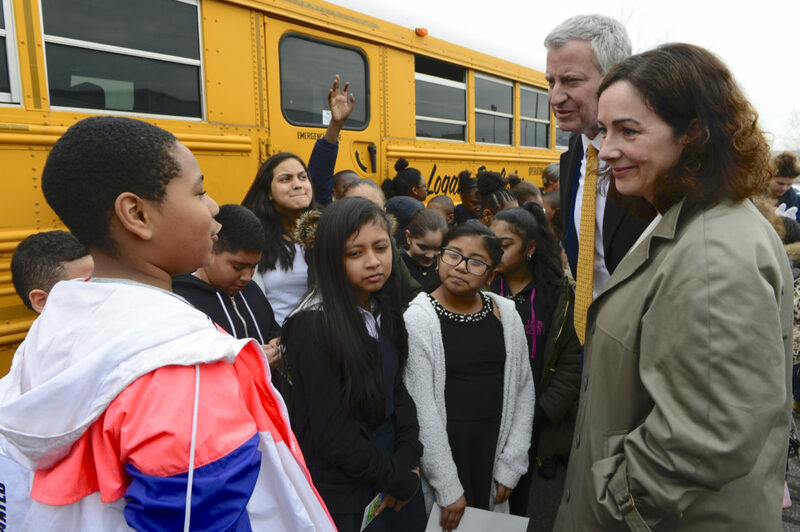 Orelia Dethers, a fifth grader said she agreed with the mayor that the planet was in danger from plastics and other pollution. The mayor added that the effort would set an example for plastic use around the city and move towards other reductions in pollution and conservation efforts. “We can get people to move away in their lives from plastics more, recycle more, turn off lights when not in use – I think young people will get people to move policies towards helping that,” the mayor added. 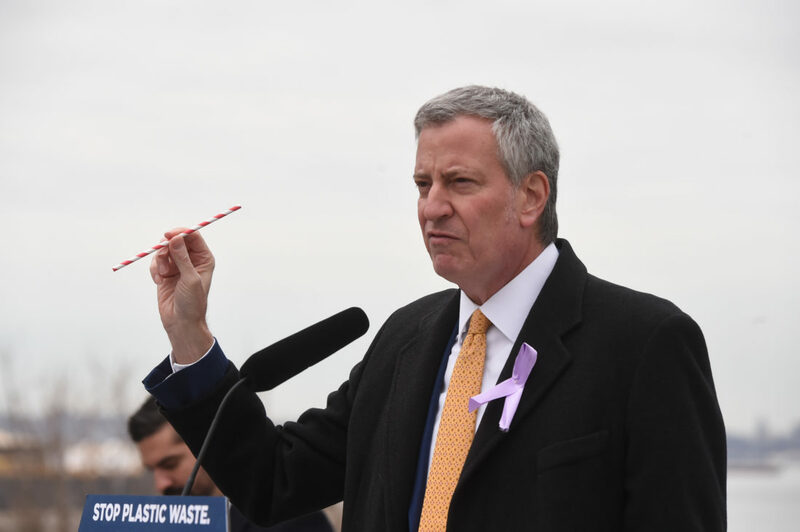 ONCE AGAIN, GOOD FOR MAYOR DE BLASIO FOR PASSING A LAW ELIMINATING PLASTIC STRAW, CUP, PLATE, BOWL AND UTENSIL WASTE FOR GOOD!!! MAY HE DO THE SAME FOR ALL PLASTICS, SUCH AS PLASTIC WATER AND SODA AND OTHER DRINK BOTTLES AS WELL!! !